SCHMOOZE has started again. Toronto’s most popular after work party hosted by CityEvents and Shanny in the City returned to Maison Mercer on Friday May 29. We celebrated patio season at the best rooftop patio in the heart of the entertainment district from 5-11 pm in support of the Canadian Cancer Society. After a hard day at work, spending a breezy summer night with friends and co workers was the best way to relax. 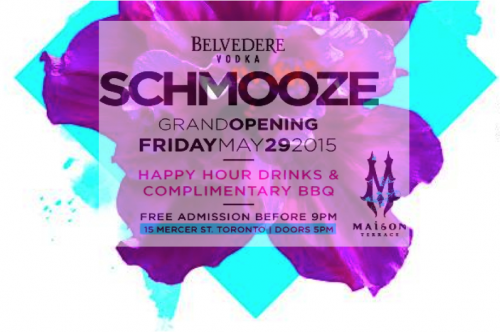 Maison’s rooftop patio offered a spectacular view of Toronto’s skyline that made for an excellent summer escape. There were refreshing drinks courtesy of Belvedere Vodka and plenty of food to go around. It truly was a great way to kick-off summer! See you next time!